Complimentary professional development symposium in Fort Wayne, IN on May 11, 2016 at Pond Pavilion at Frank Park from 10:00 a.m - 2:00 p.m.
PlayCore’s Center for Professional Development, in partnership with their GameTime brand, will offer a complimentary professional development symposium in Fort Wayne, IN on May 11, 2016 at Pond Pavilion at Frank Park from 10:00 a.m.-2:00 p.m. 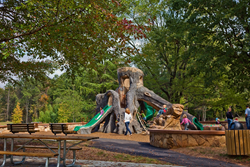 The event will include sessions that illustrate research-based best practices for infusing nature into the everyday lives of children and promoting physical activity and health in intergenerational park destinations. Fort Wayne Parks and Recreation will host the symposium designed for professionals in the fields of park and recreation, landscape architecture, and education. These events will be led by master trainer Jennie Sumrell, Director of Education, of PlayCore’s Center for Professional Development. The sessions offer Continuing Education Units for professionals and promise to be lively, informative, and educational. Lunch and educational resources will be provided by GameTime and Sinclair Recreation.